i went from not having a sewing room to having a sewing room to not having a sewing room all within years time. our first home didn't have an extra room for me to have so i sewed in my kitchen area. i also kept my fabric in my kitchen as well. it was cramped but it worked for what i needed at the time. then we moved into a bigger house (when we decided we were going to stay in our little town for the long haul) and i got my own glorious little office sewing room, wrote a book in that room, and well i created a mess that was never really organized because after 6 months of living there we found out my husband's company closing it's doors. we moved...blah de be blah you know the story and we had to find a house in two days in our current state of iowa. i love my neighborhood, i love my neighbors, and i love our schools. we got super lucky with all of our choices, except for the fact that most homes in our price range only have 4 bedrooms. sooooo we again find me not having a room to call my own as a sewing room. BUT all that has changed. well not really. i still don't have an actual room, but i do have a corner in my basement where the kids' playroom/play video games/watch movies is located. so now i can totally be in their faces whenever i need to be. i also found that white rolling shelf tray thing that holds "sergio" the serger at a garage sale. it reminds me of the one the husband's grandmother had in her kitchen. okay off to continue the cleaning and organizing. Love it! Bright and cheery and totally functional! I'd have never guessed it is in a basement--it feels so light and bright. ps. How did you hang your V? I love it!! I'm so glad you have a new space I just reorganized and it makes such a difference. It's so bright and cheery. Love all the garage sale finds. I have a room but it is dark and dreary. I'm so going to copy you and put some hexes on the wall, great fabric art! It looks amazing -- so bright and cheerful! 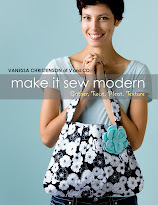 Hi-New follower, because I love, love, love your fabric line. Eggplant is truly the best color there ever was! My sewing space is in the back of my living room, not because I don't have an extra room (3 bedroom house, no kids to share with), but because I sew more when I can stay where the action is. When I'm sewing, cutting, etc, I'm hanging out with my boyfriend and our 3 dogs, watching movies or whatever. 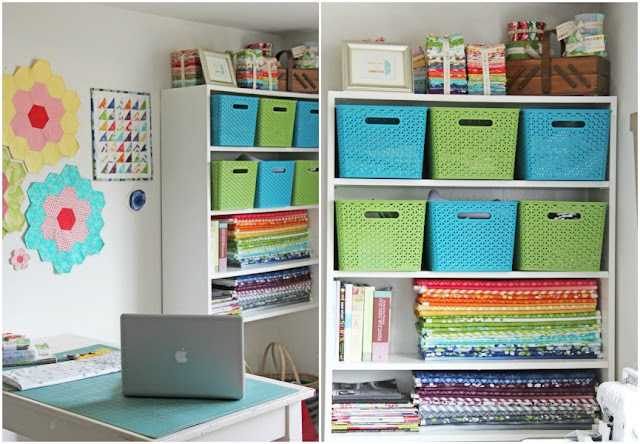 If I had kids, I'm sure I'd want my sewing space to be in their playroom. It's great to spend time together, each doing your own thing. Isn't it lovely to have your own space? It is very you!! Ack! So pretty! I love the crispness of it. It reminds me of your pinwheel quilt? Maybe? Anyway. I lurve it! My soon to be sewing space will be in the kitchen (one bedroom house with my bf and 4 dogs lol) the corner has 2 windows and it really odd shaped so we can really have much there so ive added a bookshelf for storage and my table. Also i can sew when my bf is sleeping (works overnights) and he cant hear me lol. Looks awesome! Love it! Any space you can call your own is priceless :) And garage sale finds are my fave! Thx for sharing! Love it! So bright and cheerful...I actually have the same bins from Target and LOVE them :-). I have also done the garage sales for storage in my sewing room, you might also try Craigslist...that's where I found my "new to me" sewing table. I love it! 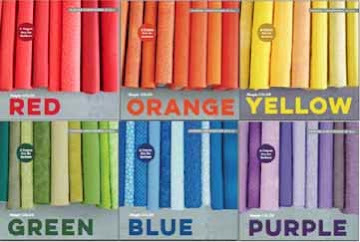 As everyone has said it is so bright and cheery and I love your fabrics sitting so pretty on the shelf. I hope you have lots of fun and creative times in there. I love your hexis and the V! How did you hang them? 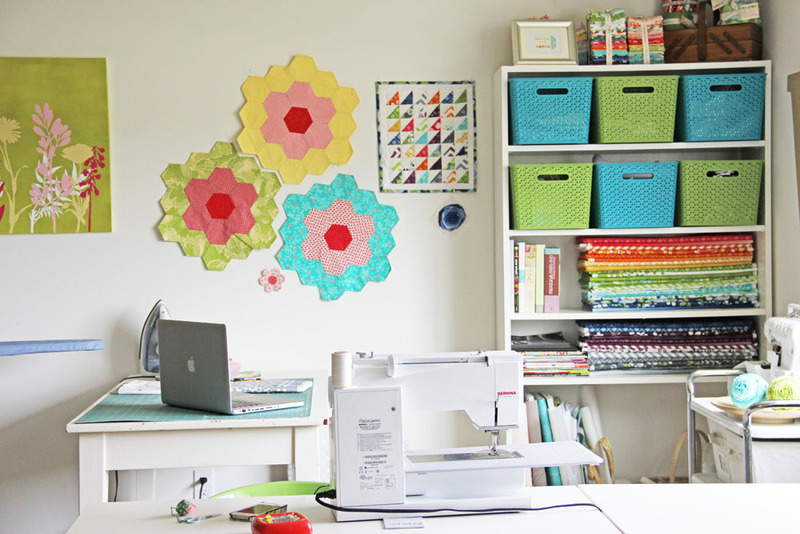 I LOVE the wall hexi flowers...how did you hang them? Details, please. seriously so cute vanessa. Love that your basement has such awesome lighting. mine is somewhat like a prison, at least I don't have to sew down there. that cart!!! awesome find! Wow, thats a basement room? I am envious! I guess with enough white paint and bright colors and lights anything can be bright and cheery. This is lovely. 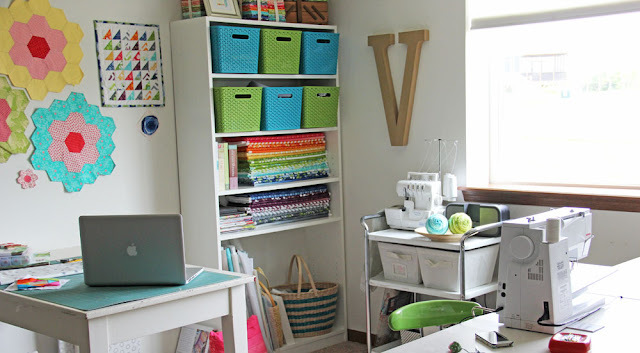 Ah... don't we love white paint and what it can do to improve the looks of a sewing/quilting room! This looks lovely - bright and fun! Nice place, tidy, bright and colourful! it looks beautiful!!! so inspiring and bright :) it doesn't look like a basement at all!!! Felicidades! Me encanta y lo quiero igual para mi! congrangats! Ilike it to much and I want one for me! My current sewing space is a corner of my husbands out building that has no windows and no HVAC. It's so dark. We have no basement, because SC does not believe in building houses with basements due to the water tables...it would flood whenever it rained too hard. I am in the process of starting the planning part of having my own outdoor sewing/craft room, complete with windows and HVAC. Some day in the future it will be complete, I hope. It's looking fab Ms. V! That white rolling cart is a keeper -- I have one in the garage that unfortunately, as a young bride, I covered with contact paper. (Gah.) I'd love to restore it but have no clue how to do it. You're so lucky yours is still looking beautiful! love it- so glorious to have even a bit of space to spread out in! i recently reorganized my sewing-crafting space and moved in a large L-shaped desk, which has been great to hold my sewing and embroidery machines...love it! love, love the clean white background - so inspiring! It's ridiculous how much light you have in your basement... I think I'd actually prefer a corner in a kids room/family room instead of a room with a door. If I have a door I end up with large piles behind it and then I sew on the kitchen table anyway. Soooo jealous. I had an extra room when we bought our house a few yrs ago but then I had an extra baby, so... Kids have have 2 playrooms on the main floor (I have 4 kids). Been contemplating kicking them out of the smaller one. I think u just inspired me to finally do some rearranging. Thanks! Great space and very colorful! You're making me want to sew hexies real bad! ...and your colors are dreamy. Organizing is my kryptonite. You are making me sad! Quit it! I miss you too!!! I just pinned them in place with needles. :) that way when you are ready to take them down you don't leave a mark on the wall or in your fabric! Lol! Yeah I'm kind of happy I HAVE to keep it clean!!! Love your space. I have gone from sewing room to no sew room to sewing room to no sewing room.. I understand the frustration.. But mine was due to grown children moving in and out. But what can u do. They have to have a roof, and I can't. Tell them no. It is dreamy! Of course you did all of this for the photo ops! Show what a daily room looks like is not conducive to pics! This can be a finest article for this subject matter I've ever read. I'm really quite satisfied with it. Maintain running a blog! Looks like it's coming together quite nicely. Love the bright colors! You have made a wonderful space in your "corner of the world." Enjoy! Looks like something out of a magazine!! Yay! I'm in the process of making a craft room in my formal dining room. We have a big space in the kitchen for our table and with three little boys I don't need them eating over carpet anyway. :) Can't wait to have it done and everything out of boxes! I love you sewing space. I love the white with all the pretty colors of fabric! It is really bright, cheery and clean!